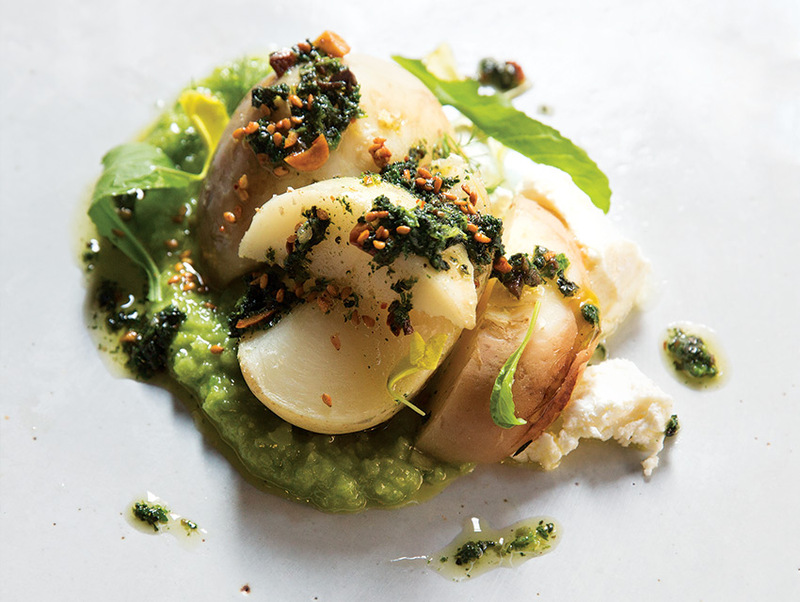 A salt-baked turnip is the star at P.Y.T. P.Y.T. is the first time Josef Centeno, the chef behind Orsa & Winston, Bar Amá, and Bäco Mercat, has tried his hand at a style of cooking that is almost entirely produce and—except for one grass-fed skirt steak—meat free. Brimming with inventiveness and offering a seed catalog’s breadth, the menu is a study in precision. Grilling over Japanese binchotan charcoal brings out the twilight sweetness in last-of-the-season figs. Shaving walnuts on a micro-plane allows Centeno to shade pristine baby carrots with a pesto made from their tops. Together with toasted pepitas, the saline kick from grated Paski sir, a Croatian sheep’s milk cheese, adds umami to creamy grits. Thickly cut San Marzanos (from a Lincoln Heights charter school garden where the chef volunteers) are at their most lyrical between flaky pastry and a swirl of crème fraîche. —P.K.